1. Log in to your Bridge. 2. Browse to a brand. 3. In the horizontal bar above the slideshow, there is a new link that says "Retailers." Click this. 4. You'll be taken to a Connections page showing you all the retailers that report they sell this brand. Your store can use this information to connect with these stores and help your store grows sales for this brand. 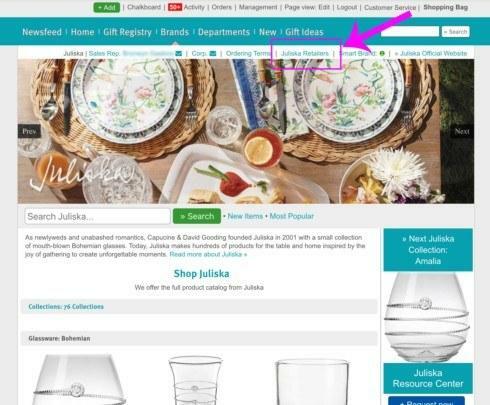 In the example shown a retailer that sells Juliska can easily view 275 stores that say they sell Juliska. 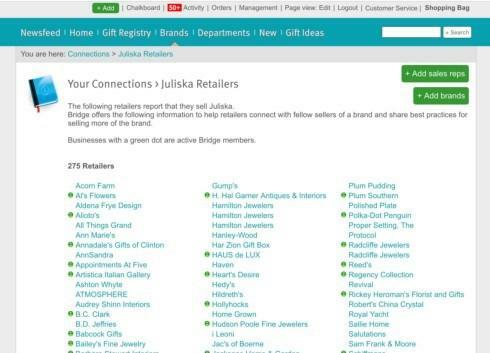 Each store's name is a link to its Bridge account or website.